Hi Everyone! Its the first Sunday of the Month and you know what that means... Jaded Blossom Challenge! This months challenge is to create a project that incorporates Green as the main color. It does not need to be St. Patrick's Day but it must incorporate a Jaded Blossom stamp. For my project I cut out a gable box on the cameo. I also cut out a 4 leaf clover on the front of it and put clear acetate paper behind it. I put mint hershey kisses in the box. The stamp is from Luck of the Irish. Thanks for checking out my post today! I hope you join in the fun over at the monthly challenge. There is a prize up for grabs! Check out what the rest of the DT did here! Very Nice Treat Box. Love the font on that sentiment so pretty. What a great treat box. Love it. super cute!!! looks like a yummy treat for sure!! That font is my FAVE! Very cute, love the detail in the clover. The more projects I see done with the Cameo, the more I think I just have to have one. 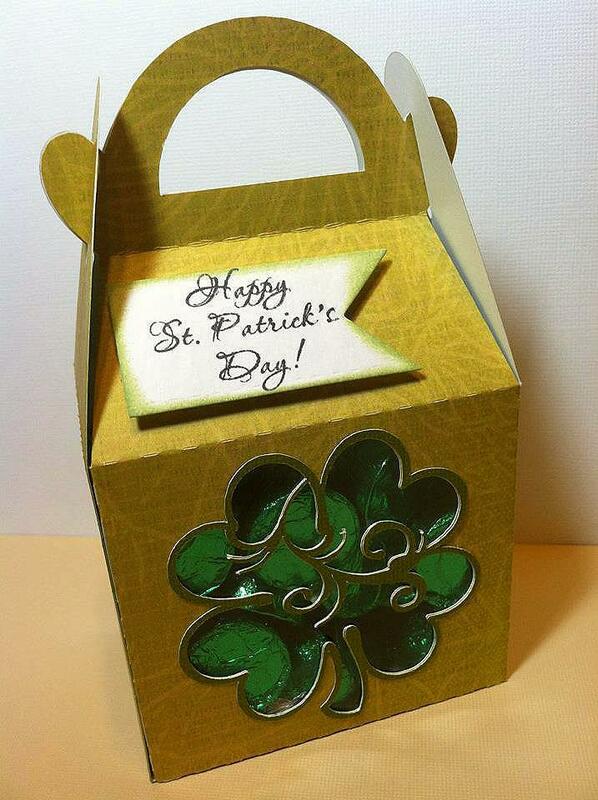 Cute treat box, Love the green acetate paper your used!